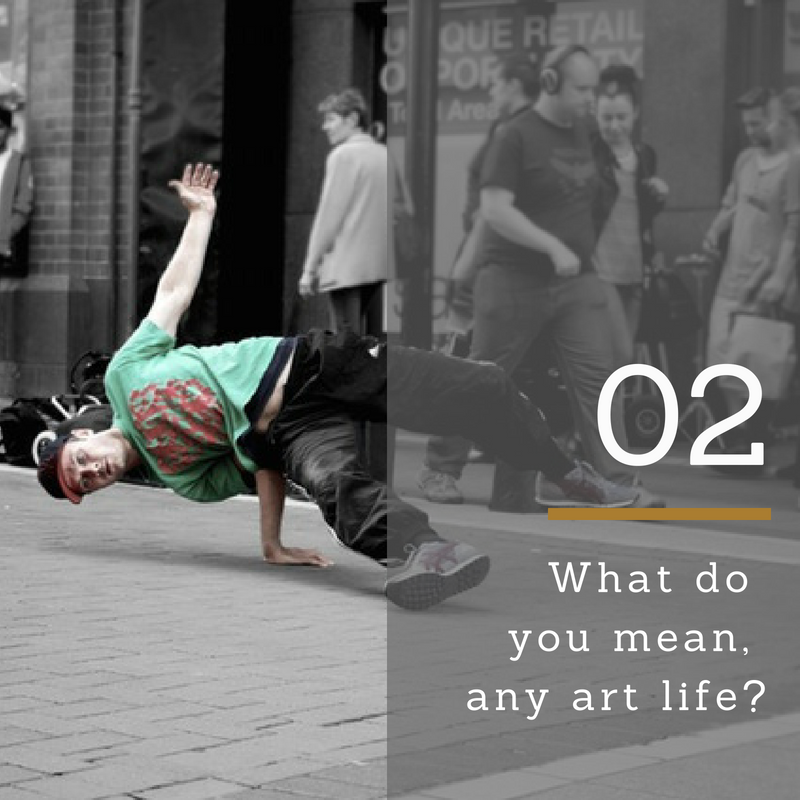 Ep 2 – What Do You Mean, Any Art Life? What do you mean, any art life? Episode 2 explores how any art life can serve God and leave a Kingdom footprint in culture, no matter what we make art about, with whom we make it, or where we present it. Welcome to episode 2 of The Kingdom Art Life, where we are building harmony between faith, art, and career. In our very first episode, I shared with you the conviction that guides my service to artists: that any art life can be a vessel for worship and leave a kingdom footprint and culture. Now, you might be saying WAIT- because last episode you said you were talking to artists who follow Christ but their careers are in mainstream culture, artists who make art that doesn’t talk about Christian subject matter, artists who don’t make art to lead people in worship or lead people to Christ. Now are you telling me that even that art life can be a vessel for worship? I’m saying yes; even that art life can be a vessel for worship and leave a kingdom footprint and culture. Today we are going to dive into what I mean by that and how in the world that could be possible. As Christ-following artists, we create art for different reasons. We come from different approaches. We use different methods. We speak to different people. We create religious art, art for social change and commentary, art for art’s sake, and everything else in between. For some of us, we can look at our art life and very easily see how it could be a vessel for worship. But, for others of us, because of what we make art about, where we present it, who we make it for, even who we make it with, it’s much much harder for us to look at our art life and see how this could possibly be true for us. And there’s a reason why we have difficulty seeing that. All the things we are engaged in as Christians tend to focus around three areas: worship, evangelism, and the faith walk. It’s very easy to embrace activities and expressions that directly serve these three areas of focus because we know how to apply them. We know where they fit. We know how they fit. However, we struggle as a church, as a body, to find value in the bajillion other activities and expressions that have no direct connections to these three areas, and yet, are still valuable and have a place in the life of a Christian. And why do we struggle to see that? Because the way we address these three areas (worship, evangelism, and the faith walk) is typically through message – through what we say in the message we’re communicating. So. if the message in your form of expression does not directly address those three areas, it’s hard to see how it’s valuable and useful in the Christian life. Because these are our three areas of focus and this is where our eyes are, everything that we do in church is a means to these three ends. So our focus is on usefulness (not necessarily in experience or broadening through questioning.) If your expression is not a clear means to those three ends, we struggle to find them useful. If we struggle to find them useful, then we certainly struggle to find them valuable. If they have no usefulness and if they have no value, then the question is why are you engaged in them as a Christian? If it doesn’t “serve God,” if it doesn’t “glorify God,” why are you doing it? This is the mindset that we, Christ-following artists with careers in mainstream culture, artists like you and me – this is the environment that we are raised in. There are some exceptions. Some of us have great and supportive churches. I have a supportive church. And I’m sure that some of you guys do, too. But that is an exception. That’s not the majority. And this is the mindset that has raised us. This mindset has raised us – artists who follow Christ, but have careers in mainstream culture – and for us, the fact remains that we don’t make art to directly serve any of those three purposes. Nor is God leading us to. Nor do we have to, to have an art like that is a vessel for worship and that leaves a Kingdom footprint and culture. Wait? How can you say that? Well, if you notice the phrasing that I have been using, which I’ve been using very deliberately, I’ve been saying art life and not just art. If I just use the word art, we get caught up in the usefulness conversation and the usefulness is relegated to the message and the results the message produces. But, that doesn’t work for artists like you and I because the message in our art, if we even have one, is not addressing church priorities. So that doesn’t apply to us. Okay. If that doesn’t apply to us then how is it possible for us? It’s possible because you and I have a life in art, not just a message in art and your life and art can glorify God, even when your message in art is not explicitly talking about worship, evangelism, the faith walk, or any other thing under the Christian sun. So, let’s talk more about this whole life-in-art business. What is that? This life in art, at least according to what God has taught me, consists of three areas. There is the person, which is who you are. There’s the process, which is how you do things. And there’s the product, which is the art piece: the movie, the song, etc. ; and by extension, it’s the message in the piece, if there is a message. Let’s look at each of these one by one. First of all, there’s the person. When people interact with you, an artist of faith, a person bought by the blood and filled with the spirit of God, they interact with more than just an artist. As a child of God, you are more than just an artist. When you step into a room, you, as a believer, carry something that impacts the environment of that room. When you interact with a life, you have the opportunity to release that life into the wholeness God has made available. When you speak with someone, the words that come out of your mouth have weight and they have power. They have life and healing. Before you ever put brush to paint, finger to keys, character to plot, steps to music, you have to know that you are so much more than just an artist; though you are an artist fully, and you are an artist absolutely. But, as a member of the body of Christ, you are a person of tremendous consequence. You have to know that just by being present, you are a vessel for worship and you are leaving a kingdom footprint in your environment. The next area of the art life is process. Your process is the way you accomplish things in your art life. How do you create art? How do you make career and business decisions? How do you go about executing them? How do you interact with other people? Even more practically, we’re talking about the way you prepare to compose, the way you negotiate business deals and pursue opportunities, the way you deal with your dancers, etc. In your process, in the ways you do things, people can get a glimpse of who God is, how he works in a life, and what life in relationship with Him is like – all by looking at how you do things as an artist and what results from you doing what you do, in the way that you do them. This can facilitate a relationship between them and God – just by watching your process and method – even when the message in your art doesn’t address the big three. Then there’s the product. Again that’s the art piece: the song, the movie, the dance, the system, the project. Romans 1:20 says that God’s invisible attributes are clearly seen and understood by the things that are made. Notice, the verse doesn’t say only things that have biblical references, or only things used for worship or evangelism, or only things used to address societal woes. It says things that are made give evidence of His existence, and give evidence to the way He works and the kind of person that He is. Regardless of the form, function, subject matter, or context of your art, the skill and creativity it displays provides evidence of a creative and magnificent God. And, how much more can a Creator be glorified, than when the thing they created does what it was created to do? God created you as an artist. So He is glorified whenever you release what he’s put in you; when you work your gifting and make art, regardless of what your art talks about…as long as it doesn’t contradict his word. So there you have it family. Hopefully you can uncross your eyes the next time I say that any art life can be a vessel for worship and leave a kingdom footprint in culture. More than that, though, I hope that you can see that your life and art is the message. The whole way you exist as a career artist is the message: from what you make art about, the kind of art you make, your process in creating art, how you manage your career, and the way you interact with people. All of that is message; so it all doesn’t have to be shoved into your art piece. Until next time, be sure to chime in on the discussion! Click here to return to podcast list. How do you envision your faith life intertwined in your career life after this episode? Was this episode encouraging, affirming, challenging, objectionable? Previous Post Ep 1 – Faith and Art: What About It? Thank you for your encouraging words. I have recently been experiencing a shift in my thinking about work and life as a Christian and your framework affirms what seems to be starting to happen in my own life. I look forward to listening to more insights from you. Hi Liz. I’m so happy you found encouragement in this episode. These are shifts in our thinking all of us have to undergo as seasons shift in our life. Be blessed!